Following a number of requests from citizens, from the European Parliament, and from certain EU Member States, work has been undertaken to investigate the functioning of the current EU summertime arrangements and whether or not they should be changed. In this context, the Commission held an online public consultation to gather the views of European citizens, stakeholders and Member States on the current EU summertime arrangements and on any potential change to those arrangements. The consultation opened on the Commission’s ‘Have Your Say’ portal 1 on 4 July 2018 and ended on 16 August 2018 with by then around 4.6 million valid replies. This report summarises the main outcomes and findings from the public consultation. EU summer-time arrangements imply that clocks are changed twice per year in all Member States in order to cater for the changing patterns of daylight across seasons. Clocks are advanced by one hour in the morning of the last Sunday of March and set back by one hour in the morning of the last Sunday of October to return to standard time. For historic reasons, Member States chose to introduce summertime arrangements. Such arrangements were first adopted during the first and second World Wars to conserve energy. Many European countries later abandoned the measure. Modern summertime arrangements stem from the time of the oil crisis in the 1970s when Member States reintroduced time switches. EU legislation on summertime arrangements was first introduced in 1980 with the objective to unify existing national summertime practices and schedules that were diverging, thereby ensuring a harmonised approach to the time switch within the single market. In parallel to, and independent from the EU summertime arrangements, the territories of the Member States on the European continent are grouped into three different time zones or standard times. The decision on the standard time is as such not affected by the EU summertime rules (or any change thereof). It should also be noted that the availability of daylight varies according to EU Member States' geographical location. Northern EU Member States have a relatively large seasonal change in available daylight in the course of the year, characterised by dark winters with little daylight and bright summers with short nights. For the southernmost EU Member States the day and night distribution of daylight is less varied during the year. Public consultation is a tool which provides transparency in the policy-making process. It informs the broader public and stakeholders about a certain policy issue and allows for the collection of views and evidence. In contrast to surveys, public consultations are not statistically representative. Web-based public consultations also have a self-selection bias of the respondents towards the views of those who choose to respond to the consultation against those who do not. These elements need to be kept in mind when interpreting the results. Taking account of these caveats, the consultation on EU summertime arrangements was very successful in terms of public interest and number of replies. 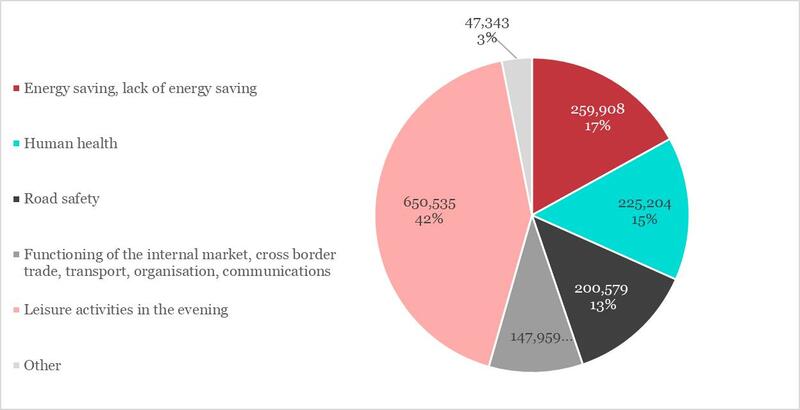 With around 4.6 million respondents, of which over 99% were citizens, it generated the largest amount of responses ever received in any Commission consultation. The public consultation was announced with a press release and dedicated interviews, and received media attention in many Member States. The consultation was also actively promoted by the different Commission representations in the Member States and on social media. Responses came from all Member States, although response rates varied across countries, with the highest response rates coming from three countries (see chapter 2). It should be noted that the largest amount of responses came from Germany (70% of all replies), which has a statistical influence on the average results. Given the unprecedented flow of replies, the consultation server was at times unstable. However, users who did not manage to submit their contribution online because of technical difficulties were able to get in touch with the Commission via e-mail (address provided on the consultation page). The Commission has taken account of replies to the questionnaire sent through other means (e.g. e-mail, post). As regards the analysis and treatment of data, this report considers all valid responses to the public consultation, i.e. after elimination of duplicates from the initial dataset. Duplicates were defined as more than one reply with the same email address. The Commission also used analytical tools to identify any campaigns, whereby the exact same response is copied and introduced by a large number of respondents from specific interest groups, which could not be found in this case. In order to ensure a correct categorisation of respondents, the information given by businesses, organisations, public authorities and Member States on their names, number of employees and email address was verified first automatically and then manually to detect erroneously categorised replies. These were then re-categorised (mostly from the ‘business’ and ‘public authorities’ categories to the ‘citizens’ category). An external contractor assisted the Commission in its analysis, in particular in verifying the categorisation of respondents and reviewing and assessing the replies with the help of data analysing tools. In parallel to the publication of this report, the Commission is also publishing all individual replies on its web-site in an anonymised way 2 . Respondents to the consultation 3 were asked to indicate whether they replied on behalf of: “themselves/citizens”, “stakeholders, businesses and consumer organisations” or ”Member State or public authorities”. 4.5 million respondents (99.8 %) replied in their individual capacity, i.e. as citizens. 8 938 replies (0.2 %) came from stakeholders or businesses. It should be noted that the latter were not asked to specify their field of activity or whether they represent private companies or non-profit organisations. 45 contributions also came from Member States or public authorities. In absolute figures, 70 % of the replies (3.1 million) came from Germany, followed by France (8.6 %; 393 000) and Austria (6 %; 259 000). Other countries whose replies represent more than 1 % of the total are Poland, Spain, Czech Republic, Belgium, Finland and Sweden. Comparing the number of respondents per Member State with the size of the population it shows that the highest response rates came from Germany (almost 4% of population), followed by Austria (close to 3%) and Luxembourg (close to 2%). In the rest of the Member States, less than 1% of the population replied (see figure 1). This section refers to global results, covering respondents from all categories. It then focuses in on the input received from citizens and stakeholders. Public authorities’ input is explained separately in section 4. 5.Preference in case of abolishment: permanent summertime or permanent standard time. The majority of all respondents (76%) stated that they have a negative experience with the switching from wintertime to summertime (and vice-versa). With regards to citizens, respondents from most Member States have a negative experience with the current arrangements – with the exception of respondents from Malta, Cyprus, and Greece. Stakeholders and business respondents also reported a generally negative experience with the switching overall 5 . Among all citizen’s replies, 3 481 000 (76 %) said they have a very negative or negative experience with the time switch, compared to 850 000 citizens (19 %) whose experience was positive or very positive. 224 000 (5 %) had no opinion on this question. 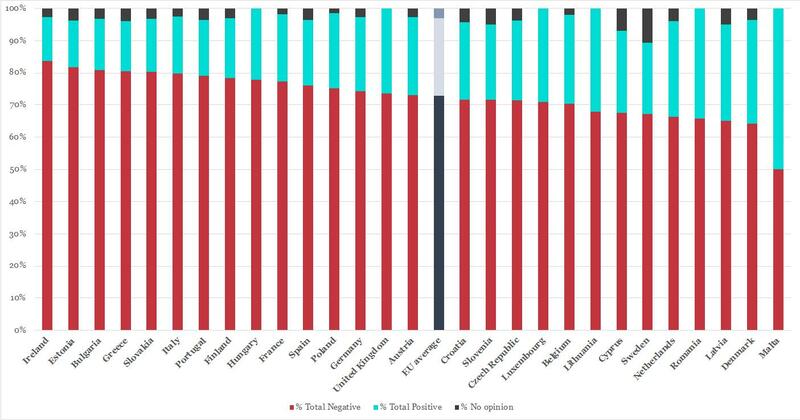 Finnish citizens had the highest number of negative responses (93%), followed by Polish (91%) and Lithuanian citizens (89%). Citizens participating from Greece and Cyprus have on average a positive experience (58% and 55% respectively). In Malta, 49% of citizen’s replying have a positive experience, 45% of citizen’s replying have a negative experience and 6% had no opinion. 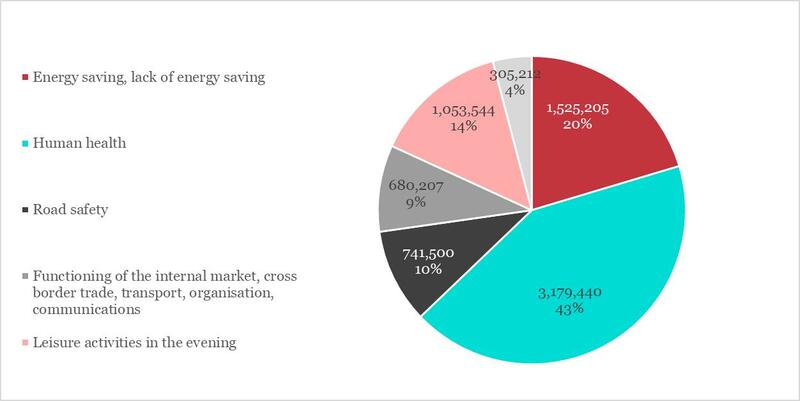 The majority of all respondents (84%) are in favour of abolishing the biannual time switch. In total, 3 800 000 citizen’s replies (84 %) are in favour of abolishing the switch between standard time and summertime. 741 191 citizens (16 %) are in favour of keeping the current system. 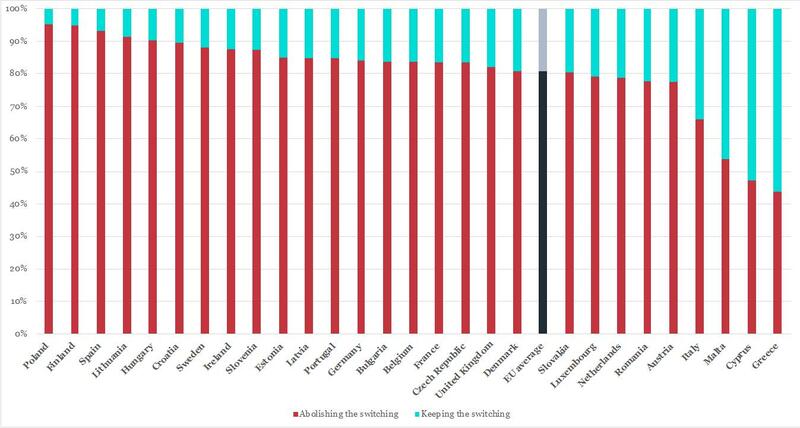 Only in Greece and Cyprus, a small majority of citizens prefers keeping the current system (56 % and 53 % respectively). Conversely, more than 90 % of citizen’s replies from Finland (95 %), Poland (95 %), Spain (93 %), Lithuania (91 %), and Hungary (90 %) are in favour of abolishing the current arrangement. Similarly, for stakeholders and businesses, a majority of respondents support an abolishment of the clock change 6 . Respondents were asked to indicate a reason for their position in favour or against the biannual time switch. Respondents could choose from a pre-defined list of possible reasons as well as "other". The main reason highlighted by all respondents that were in favour of abolishing the current arrangements is human health (43%), followed by lack of energy saving (20%), while for those in favour of keeping the current arrangements the main reason highlighted is leisure activities in the evening (42%). Respondents had to rate the importance they attach to their choice for such arrangements becoming implemented on a scale from 0 (not important) to 10 (very important). As regards citizens' and stakeholders' replies, those who are in favour of keeping the current summertime arrangement and those who want to abolish it, more than 90 % of the respondents rate the importance of their choice with at least the value 7. This finding does not vary significantly between Member States. The question was asked that, if the biannual time switch was to be abolished, would respondents favour permanent summertime or permanent standard (winter) time. Answers show that the overall preferred option is permanent summertime as opposed to permanent wintertime. 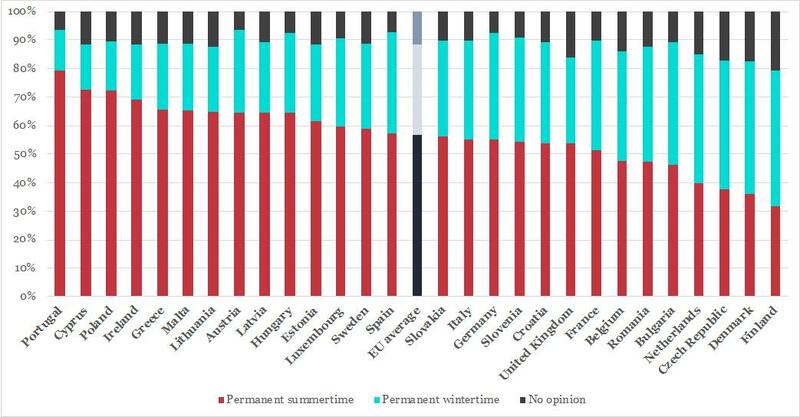 2 529 000 of all respondents (56 %) would prefer permanent summertime and 1 648 000 of respondents (36 %) would be in favour of permanent standard (winter) time, if the bi-annual time switch were to be abolished. 377 000 respondents (8 %) have no opinion on this matter. 56% of citizens who answered this question favour the option of “permanent summertime”, while only 32% prefer “permanent wintertime”. 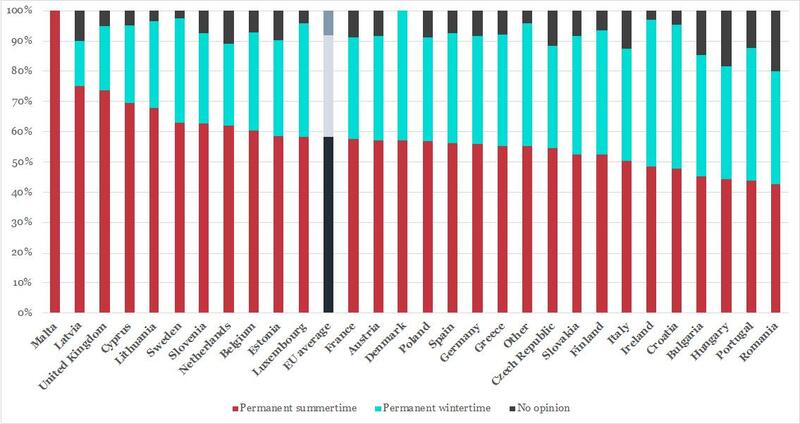 The highest share of respondents in favour of “permanent summertime” is in Portugal (79%), Cyprus (73%) and Poland (72%). The highest share of respondents in favour of “permanent wintertime” is in Finland (48%), Denmark (46%) and the Netherlands (45%). An average of 11% across all Member States citizen respondents has expressed no opinion regarding the matter. In general, responses from businesses and stakeholder groups show a clear preference for the permanent summertime, which confirms the citizens' preference and the general outcome of the survey. The EU average presents a percentage of 58% of respondents in the businesses and stakeholder group that is in favour of a permanent summertime option, while 34% are in favour of a permanent wintertime option. After cleaning up the data, 47 contributions were retained from public authorities. These contributions vary from city councils, regional authorities, a Member of the European Parliament and some national ministries. In terms of overall share of total replies, this respondent category only represents 0.001%. The contributions provided are also rather heterogeneous. While many indicate the need for a harmonised system, some mention that the current system should be maintained, while others prefer the abolishment of the time switch – either to permanent summertime or wintertime. Respondents' reasons for keeping or abolishing the current arrangements also do not seem to be firmly established. No firm conclusions can, therefore, be drawn on the basis of replies to the public consultation for this specific category. It should be noted that, in parallel to the consultation, the Commission also received a number of letters from different ministries from Member States indicating their preferences. As part of the consultation, respondents were invited to send in any additional evidence or material illustrating possible impacts of the current EU summertime arrangements and a possible change thereof. Stakeholders from the aviation sector stressed the importance of keeping a harmonised time switching system across the EU. They also pointed out that any change to the current system would have an impact on airlines schedules and slot planning and that sufficient lead-time would therefore be needed in order to allow making the necessary adjustments. The Road Safety Authority of Ireland 7 shared an existing report on the road safety impact that was made in the context of a legal proposal that was considered in the Republic of Ireland in 2012. The proposal was to launch an experiment and change the applicable time-zone of the Republic of Ireland to CET or GMT+1. The report concludes that it is not possible to come to final conclusions as with the change of daylight over the year and different time arrangements, one choice would lead to brighter mornings and the other to brighter evenings, consequently to less traffic accidents in either morning or evening conditions. But overall, one might end up with a similar number of accidents. Apart from responses received as part of the public consultation, the Commission also received 1286 individual e-mails 8 or letters stating opinions on the issue of summertime arrangements. Input which did not respond to the consultation questionnaire does not form part of the above analysis, but was still examined by the Commission. The overwhelming majority came from citizens, most of which (1088) expressed their support for abolishing the current time switch. In addition, two campaigns were identified. The first campaign was launched via email and reached the Commission in the functional mailbox for the summertime consultation. This campaign was organised by www.cyberacteurs.org and expressed the preference for a permanent standard time. A total of 1503 emails were received. A second campaign was organised by ACHED (Association Contre l’Heure d’Été Double) and was sent by means of a filled in template by post. A total of 17 contributions were received expressing the opinion to stop the seasonal time change and for a permanent standard time. 4.6 million replies to the public consultation on the summertime arrangement in the EU, coming almost exclusively from individual persons, are an impressive turnout. It shows the high level of interest and involvement of Union citizens from the entire continent in this cross-border issue. However, this public consultation is not a representative survey, nor does it constitute a citizens’ vote. Its outcome has to be considered in the context of the wider policy debate about the future of EU summertime arrangements. The overwhelming majority of respondents express their dissatisfaction with the current arrangements at EU level whereby Member States switch together from standard time to summertime in March and back to standard time in October every year. 84 % of all respondents want this time switch to be abolished. Yet, there are divergences between Member States, with a small majority of respondents from Greece and Cyprus favouring the current arrangement, while respondents from Finland, Poland, Spain and Lithuania are almost unanimously (over 90%) in favour of abolishing the time switch. Replies are more heterogeneous to the question of what should replace the current summertime arrangement if it were to be abolished. Although a clear majority of respondents would prefer “permanent summertime” in this case, there is also a more significant minority (36 %) in favour of “permanent standard time”. Most frequently, respondents who are in favour of abolishing the time switch give health considerations as their main argument (43 %). Respondents who are in favour of keeping the current arrangement most frequently refer to their evening leisure activities (42 %). There were 4.7 million replies. After cleaning of duplicates the total number of valid replies is 4.552.330. Under question 3 respondents could choose from a pre-defined list of possible reasons or add free text to explain their answer. From Malta, only two stakeholders responded; they were divided on this question.